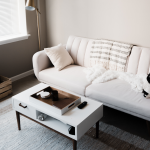 A recent 2019 Resale Report by thredUP (PDF) predicts the secondhand apparel market will reach $51B by 2023. Secondhand apparel is the consumption of all used apparel that enters the secondary market through consumer returns and resale. This is good news for apparel retailers that need to recover from the costs and logistics associated with returns and excess stock; a secondary market channel can: keep supply chains moving and enable the retailer to recover costs associated with returns—processing, shipping, repackaging. What’s more, selling through the secondary market is a better solution compared to landfills or destroying stock, something that can wreck a brand’s image in today’s socially and environmentally conscious landscape. The reports looks at who is buying secondhand apparel, what matters most to them, and how the overall apparel market will shift in the coming years. The thredUP report states that in 2018, 64% of women had bought or were willing to buy secondhand products (that’s 54 million women). This is a 42% increase from only two years earlier. Millennials now represent the majority of secondhand consumers (33%) with Boomers a close second (31%). Gen X (20%) and Gen Z (16%) make up the remainder of the secondhand consumer base. 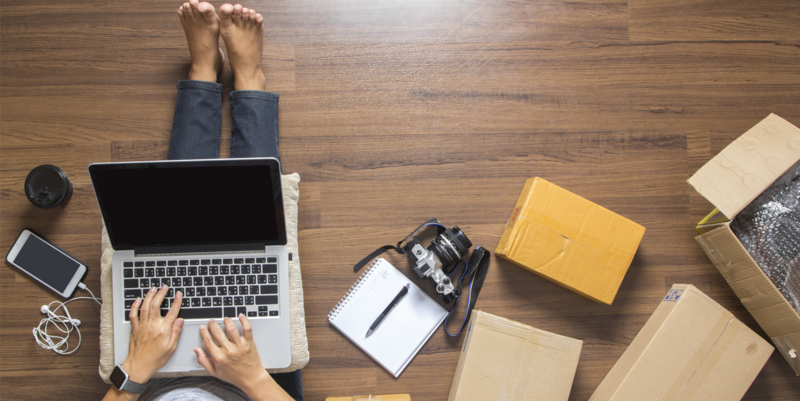 But don’t let Gen Z fool you: the report states that more than one in three Gen Zers (18 to 24 years old) will buy secondhand in 2019; representing 46% growth from 2017 to 2019. 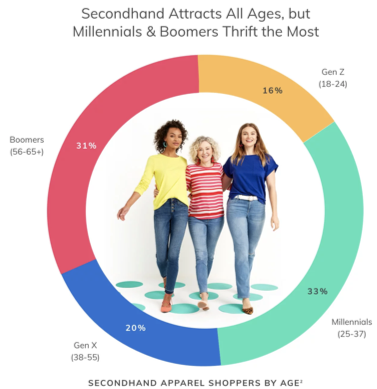 Meanwhile, Millennial (25 to 37 years old) secondhand apparel shopping grew 37% over the last two years. Analysis from thredUP confers with earlier reports that marketing to Gen Z includes transparency, social consciousness and sustainability, not only for the environment, but economic sustainability as well. Close to 60% of consumers expect retailers to create clothes ethically and sustainably. (read B-Stock’s recent assessment of Sustainable Solutions for Sustainable Fashion). 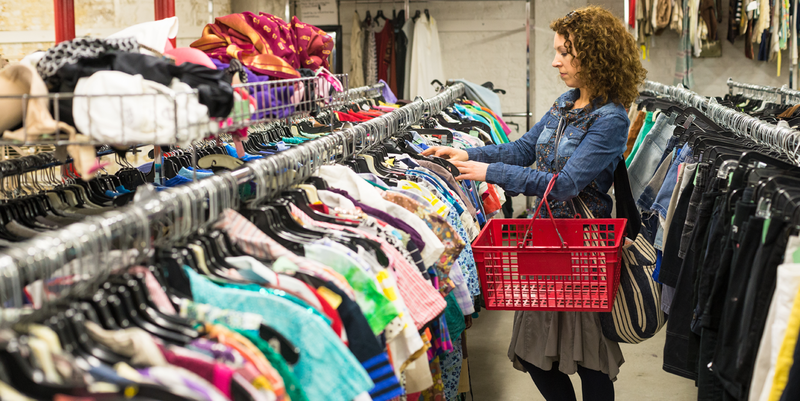 Over the next 10 years, the thredUP report claims that Secondhand sales will exceed Fast Fashion primary sales by $20B. However, Fast Fashion is expected to grow by 25% to represent $44B in business. 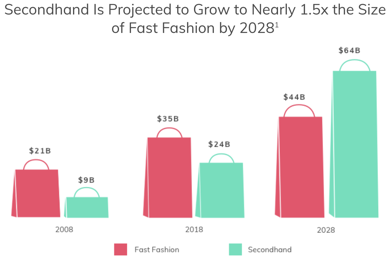 By 2023, Secondhand apparel should achieve 16% annual growth and should hit $51B in sales; with overall Retail Apparel growing 3% over the same time period to reach $431B. Due to these growth projections, nearly nine in 10 Retail Executives want to get into resale by 2020. The top five reasons retail executives are researching resale opportunities include: 1. Revenue Boost; 2. Show Sustainability; 3. Increase Customer Loyalty; 4. Attract New Customers; 5. Increase store & site traffic. A B2B channel for returned and excess apparel is one way apparel retailers and brands can leverage the secondary market. 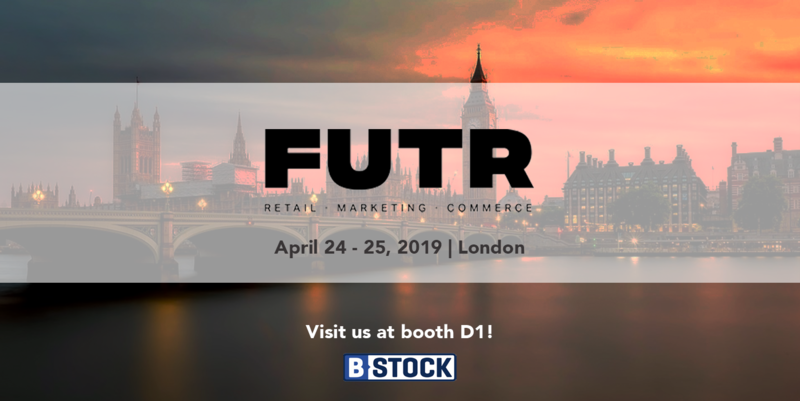 Our B2B marketplace solution enables retailers to sell returned apparel that can’t go back on primary shelves due to product obsolescence or wear and tear. 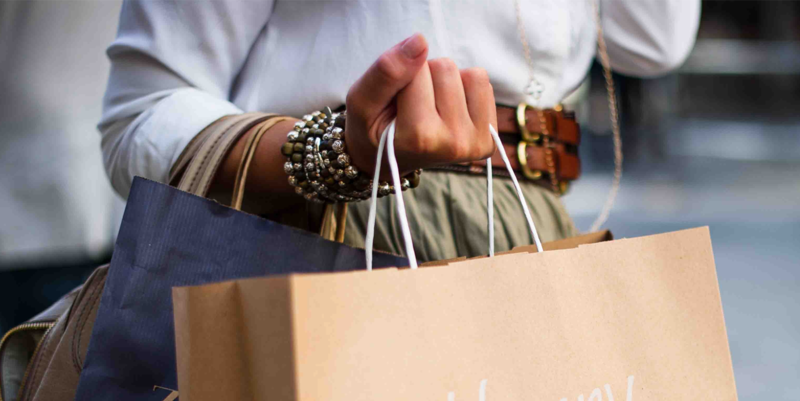 This type of secondary market channel gives retailers an opportunity to not only offset loss from returned items, but also support the circular economy and sustainability initiatives. In turn, this will increase customer loyalty and attract new customers. Returns are the rule in retail. For items that can’t go back on primary shelves, talk to B-Stock for your own private, auction marketplace to sell returned, excess, and other liquidation inventory. This technology-driven approach will increase recovery rates on consumer returns and will keep warehouse inventory moving. We also invite you to review our case studies and our suite of private marketplaces that we operate for 9 of the top 10 U.S. retailers and hundreds more.